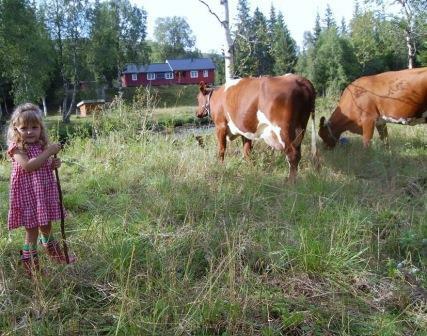 Mountain farming at Holsingsetra was initiated in 2007. Prior to that we had young animals at rough grazing for several years. The last time there was traditional mountain farming here, was in the late 1880’s. The Holsing farms were granted mountain farm privileges in 1723, which were used continously until the end of the 1880’s. In 1974 Holsingåsen received privileges at Holsingsetra. Meadows were cleared and a new cottage, shed and barn was built. 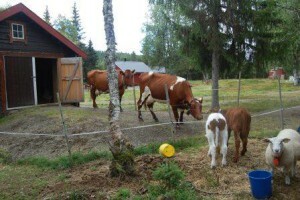 The mountain farm was used as pasture for young animals until 2004. In 2004 a road to the farm was built, and paths at the meadow developed. A stable, which was used in connection with forestry in Roktdalen from 1943, was moved and renovated to a barn at the farm. The old barn was then rebuilt to a room for refinement, where milk is refined to farm products. In 2008, the cottage was rebuilt and extended with a bedroom and wheelchair accessible bathroom facilities. 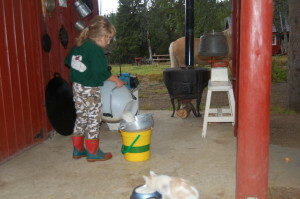 At Holsingsetra we have: 2 milk cows, 2 calves, 2 lambs, 2 piglets, hens, bunnies, cats, a dog and a horse. The milk from the cows forms the basis for our production of cream, sour cream, “gomme” (sweet cheese made of long-boiled milk), yoghurt and cultured milk. We serve home made sour cream porridge with cured meat and black coffee made on the bonfire. By doing traditional mountain farming, we keep an important part of our cultural heritage alive. We are happy to share this experience with others, and have put a lot of effort into making this environment accessible for everyone. To spend the night at a mountain farm makes you feel close to animals and nature, and is perfect for families. There are many activities for you to join: Farm animals to feed and cuddle, learn about the daily running of a mountain farm, riding, fishing, hiking, cycling and boat trips. 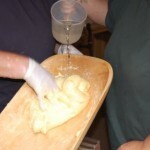 The food served at the farm is traditional home made rustic fare. Join us for a one-day visit or stay the night – have a vivid holiday in a genuin mountain farm environment! Cell phone reception is poor on the mountain farm, we consider this an advantage for our guests. Sometimes it is good to calm down and focus on sounds and impressions from nature alone. Contact us by phone. If you can not reach us, send a text message, and we will call you back. Welcome to our mountain farm!